The beaver slapped the water like a drum then disappeared. A second one shot off the bank a hundred yards away, cutting a V across the surface in a long arc. Its tiny black eyes stared at me until it slapped an alarm of its own. I thought of voyageurs and the Boundary Waters, of portage trails snaking into the continent from lake to lake, of blue water and granite. The Hudson still has some of that magic, pieces from a time when schools of migrating fish swam thick enough push a ship’s rudder. Then I saw a white sign nailed to a tree above a picnic table. “What’s that about?” I thought. I pulled out my phone and typed in “PCBs” and lists of websites poured out. PCBs were used in electronics until the United States banned them in 1977. They’re linked to liver, kidney and nervous system disorders; developmental and reproductive abnormalities; and cancer in lab animals. General Electric dumped 1.3 million pounds of them into the Hudson River. I floated under the sign, reading and thinking of mud squeezing through my toes every time I got out of the boat, of water splashing over the bow and soaking my clothes, of the signs at every dock telling people not to eat the fish. I looked around, afraid to touch anything because General Electric made millions in profit by turning two hundred miles of river into an EPA Superfund site. A few miles later, I saw a girl, maybe ten years old, fishing off the bank. She reeled like mad until a fish leapt to the surface, spinning and flopping on her line. It spun in the air, she screamed in joy, and her dad raced down from their house to help her. I remember fishing with my dad once on a lake high in the mountains. I was about her age. It’s one of my first memories, the vivid kind that always comes into my head when I see a kid with a fishing pole. We caught a rainbow trout and I remember watching it cook on the fire. I can still see the foil wrapped around it. I can smell the butter crisping the edges. “Careful with bones,” my dad said when he handed me a piece. The little girl’s dad held the fish for her to see then tossed it back into the water. There would be no tin foil, no butter, no fish, no memory of that time she caught dinner. Just past sunset, I came across giant barges and men working with cranes to scoop soil out of the riverbed twenty-four hours a day. I sat in the darkness and watched them dump buckets of wet dirt into barges lit with electric lights. General Electric never wanted this part, the clean up. It took two decades to force them into it. They threatened to move their factories and destroy the local economy. They ran ad campaigns and told people PCBs were just an overblown environmentalist scam. They did everything they could to run away. But they’re used to stealing memories of fish and tin foil from little girls, of robbing me and you, all of us of a river, and sending suits to courtrooms to explain it away. General Electric has seventy-five Superfund sites across the country. I found a dark spot along the bank hidden by fallen trees. Fireflies popped in and out of the night, lighting the forest in like a starry sky. It felt magical, or it felt like it could have been, before I didn’t trust the soil, before I felt unsure about the world around me. I hung my hammock and floated in the blinking stars. The Hudson River is one of the most complex rivers in the country. It floods with tide, it has dams and locks, it has nine million people living around it. Fifty years ago, people joked that it was an open sewer. Polluters had essentially stolen the river from the public by using it as their dumping ground. Riverkeeper’s efforts patrolling the water and taking polluters on in courtrooms has been instrumental in restoring the river. They’ve held polluters accountable and forced them to spend hundreds of millions of dollars cleaning up the Hudson. They’ve worked to get better laws passed to protect the water and educate people about the Hudson River. Their efforts have inspired other “waterkeepers” on more than 180 waterways across the planet. When I passed through Ossining, New York, I was lucky enough to meet some of the people working at Riverkeeper. They are an amazing group and I’m glad that I saved some of my budget on the return trip to donate in support their efforts. I urge you to check out their website and learn more about their efforts on the Hudson and how you can help. Posted in Angle to Key WestTagged Angle to Key West, Cleanup the Hudson, General Electric, hudson river, pcb, PCBs, pollution, protect the route, RiverkeeperBookmark the permalink. Great blog. All of us have to do better, much better. “What a wonderful world”, Louis Armstrong sang, before Joni Mitchell’s cautioned “They paved paradise and put up a parking lot.” We are some place in between and pulling for Louis. 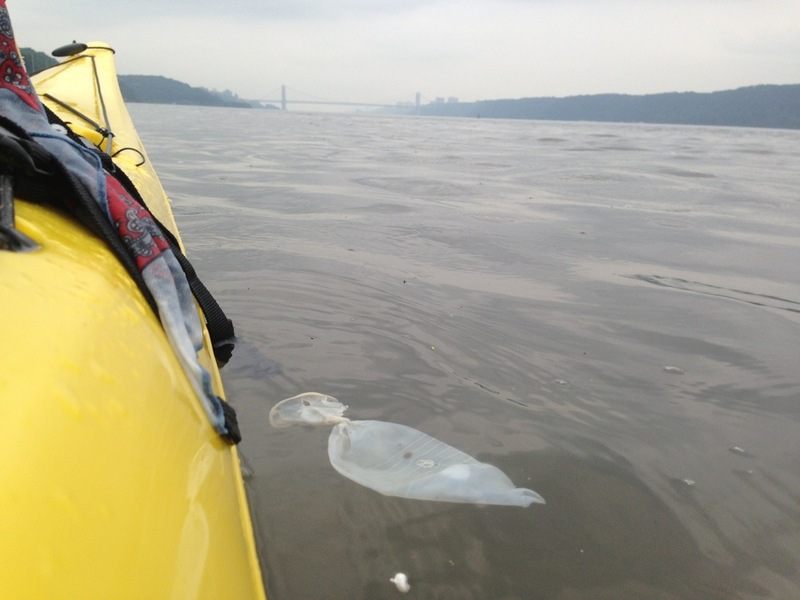 My many thanks to Riverkeeper’s….donation on the way. P.s. I love the balloon picture and the caption. Your story makes me cry just to think of it. Yes! Support Riverkeepers! But also think…are my investments supporting companies like General Electric? Divest! Then refuse to buy their products. Then write and tell them what you did and why. Vote with your wallet! I love rivers….love them…. my childhood summers were filled with the beauty and joy of a river that flowed soulfully on into the Chesapeake Bay. It was a world of crabbing, swimming, sailing, skiing, fishing, the sound of speed boat motors. It was my companion everyday. I loved to see it stretch far off, smell it’s special river fragrance and hear the comforting sound of waves lapping against the pilings of the big pier. I have been blissfully unaware of what G.E. has done to the Hudson. It’s a good reminder that being outdoors you can’t help but worry and want to care for the magic-full natural world around you, because the connection is so darn obvious. It’s a sad story, but it also gives me hope. Because getting people outdoors seems easier somehow than fighting the GEs alone. Yay for fishing gal. Paddle on sweet D! This is such a well done description, and captures the way I always feel: It’s so beautiful. It’s so messed up.